Italian ryegrass (Lolium perenne spp. Multiflorum), is an annual grass common in Sacramento Valley orchard and field crops. This species germinates and matures approximately at the same time as winter cereals and is highly competitive for soil nutrients during the time when wheat is tillering. It can also interfere with harvest and it has been reported that Italian ryegrass can cause up to 80% reduction in winter wheat grain yield due to competition for nutrients and water. Information about weed management can be found on the UC IPM guidelines for small grains: here. Pre-emergent herbicides are not commonly used in small grains production in California, but there are several options for POST emergent herbicides. 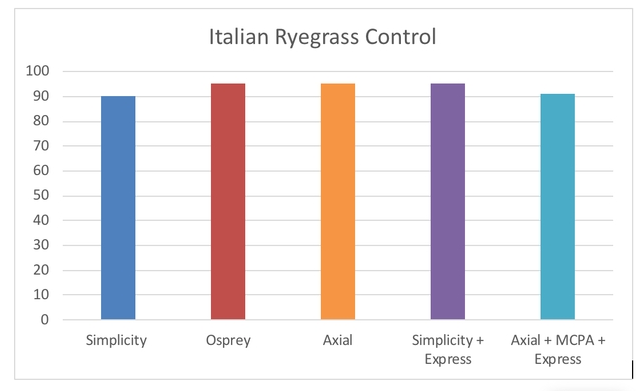 UC Cooperative Extension (UCCE) Farm Advisor Steve Wright and his group conducted some testing and found that Osprey, Simplicity CA and Axial were effective in controlling Italian ryegrass. Broadleaf herbicides, such as Express or MCPA, can also be mixed with Simplicity CA and Axial to broaden the spectrum of weeds controlled (Figure 1). Unfortunately, cases of Italian Ryegrass populations resistant to one or more herbicide modes of action have been reported in California and in other states. Brunharo and Hanson reported a population of Italian Ryegrass from Hamilton City resistant to Gramoxone, Envoy and Osprey. In Oregon, Liu et al. found a ryegrass population resistant to pinoxaden, the active ingredient of Axial. In the Sacramento Valley, the short rotation interval already limits the availability of effective herbicides because of safety concerns for the next crop. The spread of herbicide resistant ryegrass could further reduce our viable options. If you are looking for more information or interested in cooperating in Italian ryegrass management trials, feel free to contact me at the UCCE office [(530) 865-1105] or via email (mfgalla@ucanr.edu).